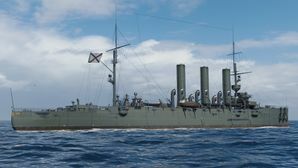 Diana — Soviet promo premium Tier II cruiser. Diana in game is very similar to her sister ship Aurora (found at Tier III). She has fewer main guns than Aurora, but she makes up for it by having secondary batteries. As a Premium ship, Diana doesn't have any upgrades to research. As a Premium ship, Diana comes included with Type 9 camouflage that lowers her detection radius, reduces the accuracy of incoming shells, reduces her repair costs, and increases the amount of experience she earns. Diana actually had a total of 24 x 75 mm Canet secondary guns. The current in-game version has only 12. The other 12 missing 75 mm guns are located along the sides of the hull, but the sponsons are strangely modeled with their hatches closed. As the above video stated, Diana was also later refitted with ten 130 mm/55 Model 1913 guns.